8/31/18 - Shop St. Vrain ReStore on Labor Day - Monday September 3rd - 1351 Sherman Drive from 9A.M. to 7P.M. You never know what kinds of treasures you'll find. 50% off everything in store (*see exceptions above). Your purchases help us build more homes and build a better future. Thank you for supporting Habitat for Humanity of the St. Vrain Valley ReStore. 8/31/18 - Thank you to our Wells Fargo, Pride of The Glens Coalition, and St. Vrain Habitat staff, board members, and volunteers who joined us for a landscaping day at Clem DuFour Park in The Glens neighborhood of Dacono. The flowers look beautiful. Thanks Wells Fargo for supporting The Glens in Dacono as part of an initiative to revitalize neighborhoods across the country. 8/27/18 - Thank you, Wells Fargo, for supporting The Glens in Dacono as part of an initiative to revitalize neighborhoods across the country. The above picture was captured on Saturday, August 25th at the first of two park beautification days in The Glens neighborhood of Dacono. St. Vrain Habitat in Top Tithers Again! 8/17/18 - St. Vrain Habitat ranks #5 (for medium-sized service areas) on Top Tithers of the Habitat affiliates. Three other Colorado affiliates also received this distinction – Denver Metro (#2 in Very Large), Pikes Peak (#10 in Large) and Vail Valley (#7 in Small). We are proud to do our part to support our international sister affiliates! To read the report, click here. 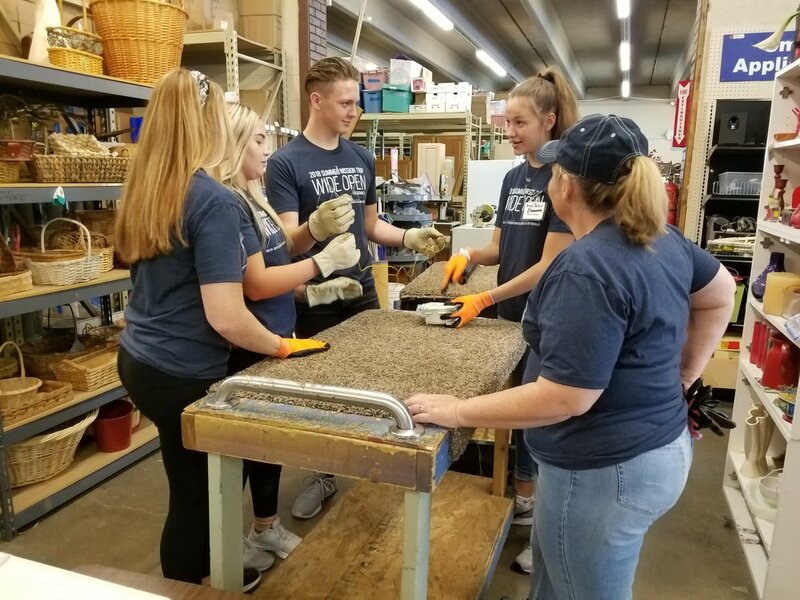 8/8/18 - St. Vrain ReStore recently hosted two groups for a day of service and expects to host four more groups by early September. We can always use the talents, skills, and efforts of volunteer groups and individuals. We love our volunteers. To see more volunteer photos, visit our ReStore Facebook page. Interested in volunteering? Learn more here. Eat Pizza. Drink Beer.Do Good. 8/1/18 - Join us for the official #HouseThatBeerBuilt Kick-off Party at Parry's Pizza!